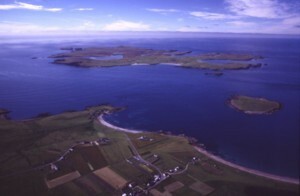 Papa Stour is found to the west of mainland Shetland, at the southern edge of St Magnus Bay. Covering an area of over 2000 acres the island has a high point of just less than 90m at Virda Field in the north west. The Norse name "Papey Stjora" meaning the big island of the Priests, was given to Papa Stour by the Vikings. This suggests that missionary priests of Celtic origin may have formed an isolated community here, perhaps as early as the sixth or seventh century. By 1299 there was a Norwegian royal farm on the island, a fact attested to by documentary evidence; and the dig carried out at The Biggins between 1977 and 1982 by Dr. Barbara Crawford of St. Andrews University uncovered the remains of an early 13th century Norse house. Recent investigations into land cultivation have also been conducted at this site. 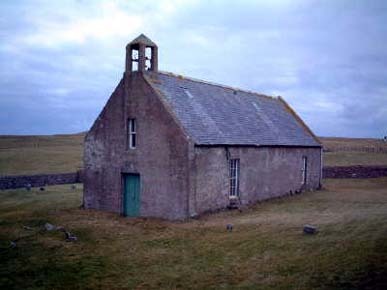 Until the 17th century, Papa Stour remained under the rule of the Lords of Norway despite Shetland having been pledged to Scotland as a royal dowry payment. The Mowat family became the factors for these Norwegian aristocrats and until recently their armorial stone was still visible in a byre wall at North House. By the 18th century two lairds owned the island, Thomas Gifford of Busta and Arthur Nicolson of Lerwick and they maintained a prosperous fishing industry known as the Haaf - carried out in the summer season using six man boats known as sixareens. 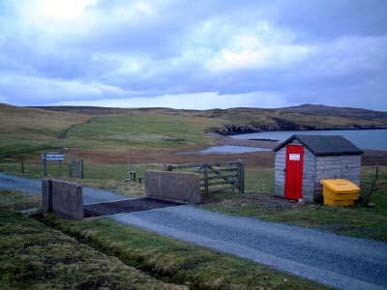 In the 19th century the population of 360 inhabitants was stabilized by the opening of the Crabbaberry fishing station. Unfortunately the advent of the steam drifter, which centralised the fish curing industry in Lerwick, and the lack of peat for household fuel reduced the population dramatically. By 1940 only 100 people remained on the island and these only through help supplied by Government war grants. After the war, with the men away at the whaling and the children having to go to the mainland for secondary education, the population continued to fall; and by 1970 it had reached a critical stage. Only sixteen people still remained when, through an advertisement in the national press, a number of young couples came and settled. The school was reopened and for the next twenty years the population remained stable. By 1996, the island was once again in need of repopulation, the numbers having sunk to less than twenty once more. Visit Shetland - Papa Stour page from the Visit Shetland site contains plenty of information...including how to get there. Shetland Heritage - Papa Stour page from the informative Shetland Heritage site. Papa Stour Images - Small collection of images of Papa Stour from the Charles Tait collection.